Keeping your Cavalier King Charles Spaniel shiny and beautiful isn’t difficult. A little regular care goes a long way. 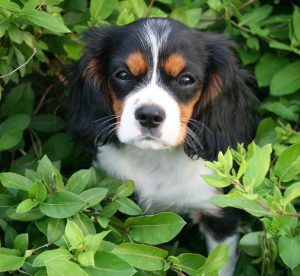 It can take a Cavalier King Charles Spaniel puppy six months to a year or more to grow into their long, luxurious coat. Thus, puppies need very little grooming per se. However, as the owner of a Cavalier puppy, your job is to help prepare your dog to be at ease and enjoy grooming sessions by the time they become adults. Introducing your Cavalier to grooming should be a gentle process. While holding your puppy, begin by moving your hands over your Cavalier’s body with an easy light touch. Gradually over time, try to extend the time your puppy is comfortable having you hold his paws. Gently using your fingers to massage each of your puppy’s toes will pave the way for clipping your dogs nails later. For puppies, a soft bristle brush is likely to be the only tool you’ll need for grooming. You may choose to try a grooming glove, as well, with a light massaging action. As your Cavalier King Charles Spaniel grows and his coat lengths, you’ll need to expand your grooming tools to include a metal comb (ideally with two different size teeth), a pin or slicker brush, and a de-shedding tool. At any time you add a new tool to your collection, give your pet a chance to see and smell the item, and begin using it in short sessions with a light touch until your Cavalier King Charles Spaniel understands there is nothing to fear. Finding a safe place to groom your Cavalier depends largely on your dog’s age and how familiar he is with your grooming ritual. With puppies, in particular, it’s vitally important to realize they may squirm around or make a sudden jump while being groomed. If you decide to lift your dog to a height that is comfortable for you to stand while grooming your pet, protect against possible injury by restraining your Cavalier with a tether. Though it’s perhaps less comfortable for the owner, it can be much safer to sit on the floor to groom your Cavalier. To prevent hurting your dog and damaging his beautiful coat, make sure your Cavalier King Charles Spaniel is completely dry before beginning to groom your dog. Wet or sticky knots of fur are especially difficult to work through. Regardless of the part of your Cavalier’s body you are working on, the general approach is to begin with a pin or slicker brush, making short strokes at the very tips of your Cavalier’s fur. As long as you don’t feel any resistance from tangled fur, you can then take progressively longer sweeps with the brush. Once you’re confident the brush moves easily through your Cavalier’s coat, you can use a comb for the final finishing strokes. For the average pet owner, there is no “right” or “wrong” way to brush your Cavalier King Charles Spaniel’s coat. As grooming your Cavalier should be relaxing for both you and your dog, it may be best to begin with your dog in the “sit” position, brushing out the fur on the chest and then down his back, before your dog relaxes into his “massage,” by lying down. As your pet lays down, you can easily brush his sides, under his legs and the long feathering of his legs. Hold the long plume of tail feathers out of the way until you’ve brushed or combed out the fur along his hind quarters. The famously long and lustrous ears of your Cavalier King Charles Spaniel will generally require some time and an extra gentle touch. Turn the ear over on to your dog’s shoulder and begin by brushing the inside of the ear, starting from the ends and gradually moving closer to your pet’s head. When your brush moves easily from the head to the tip of the ear on the inside, turn the ear over and follow the same approach for the outside of the ear. If you decide to your Cavalier King Charles Spaniel’s coat needs further thinning, you may run a deshedding comb through his fur after you have throughly brushed and combed your dog’s fur. The hardest part of grooming your dog will be dealing with snarled or matted fur. It’s not unusual for the fur of a Cavalier King Charles Spaniel to become tangled under their ears, in the feathering of their chests or under the tail. Regular grooming is the best prevention against these difficulties as brushing removes dirt from your pet’s coat and distributes their skin’s natural oils throughout their coat. When you do encounter a snarl or matted fur, set the brush aside and begin by trying to ease the knotted hair apart with your fingers. If you find it necessary to use your metal comb, begin with the widest teeth and hold the comb as you would a knife. Slowly, pull a few strands of hair out of the knot a little at a time until you can free the tangle. If you find mats under your Cavalier’s ears, in particular, this is a good time to clean your pet’s ears. Ear wax and dirt make snarls more likely to occur. Wet a cotton ball with a safe, non-alcohol-based ear cleaner to remove dirt from your pet’s ear canal. 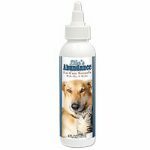 (I always used Life’s Abundance Ear Care Formula to clean Bentley’s ears.) You may also use the ear cleaner for the fur around the ear. Many pet owners (myself included) believe a Cavalier King Charles Spaniel’s cost should never cut or shaved aside from clipping fur between the foot pads. Other owners like to shave their Cavaliers’ costs in warmer weather. Bentley was never professionally clipped as my neighbor’s Cavalier sported a thick curly coat after been shaved every summer. However, unless you’re planning to show your Cavalier, it’s strictly a matter of personal preference.